Disaster recovery planning is the mechanism by which are anticipated and addressed. Just what is a “technology related disaster”? Oddly enough, the first challenge in the planning process is to quantify the meaning of the word in the IT management context. Action Item: It’s time to get your disaster recovery plans underway with the steps and techniques provided in our full IT Service Strategy Toolkit. To provide for an orderly recovery process, reducing “panic” decision making. In the IT management context, there are many levels to defining “disaster” and multiple options to address each level. To make things easier, the broad view of disaster recovery can be broken down into three (3) primary planning options –prevention, anticipation and mitigation. The goal of “preventative” disaster recovery planning is to ensure that all key systems are as secure and reliable as possible, in order to reduce the frequency or likelihood of “technology related disasters”. Since natural disasters usually lie outside our sphere of influence, prevention most often applies to systems problems and human errors, to include physical hardware failures, software bugs, configuration errors and omissions, and acts of malicious intent (virus attacks, security violations, data corruption…). Using the right set of tools and techniques, it is possible to preclude both the occurrence and related damage from any and all of these sorts of “disasters”. Anticipation strategies revolve around “assumptions” …. the ability to foresee possible disasters, in order to identify possible consequences and appropriate responses. Without a crystal ball, contingency planning can be a challenging process. It involves knowledge and careful analysis. Knowledge is derived from experience and information …. understanding the systems you have, how they are configured, and what sort of problems or failures are likely to occur. And the related analysis involves a careful balancing of circumstances and consequences. Mitigation is all about “reaction and recovery” …. the ability to respond when and if a disaster occurs. Accepting that certain disasters are unavoidable, and perhaps inevitable, the goal of any mitigation strategy is to minimize negative impact. Maintain an “alternative workplace plan” to allow designated staff to work from home or other locations. If your IT shop has the right skills, open source systems management tools may be a fit for your data center and save money over proprietary solutions. This slides will show features some of the top tools. Usenix, a systems administration user group, and Zenoss, an open source systems management vendor, recently completed a survey on open source systems management software use between 2006 and 2009. Respondents were attendees of the organization’s Large Installation System Administrators conference. 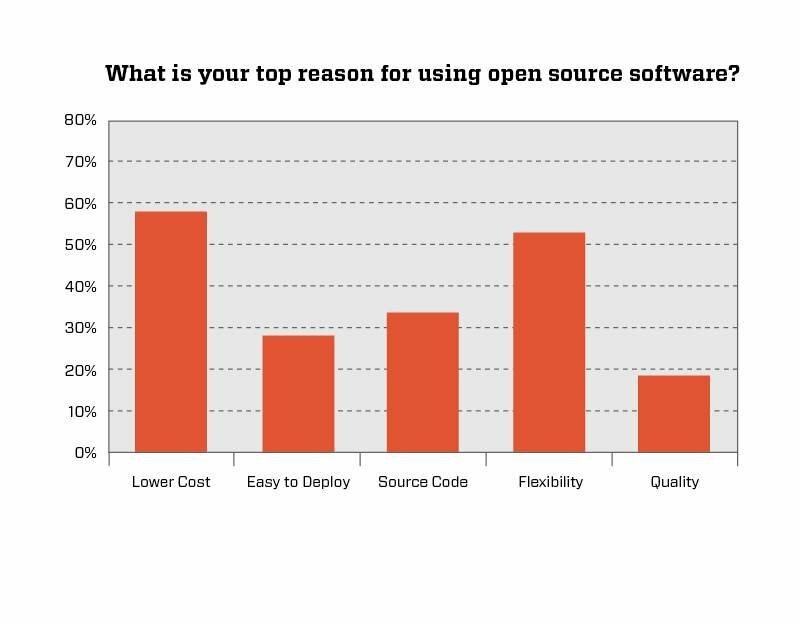 Nearly all respondents use or plan to use open source systems management tools, with many shops turning toNagios, Cacti, Zabbix, GroundWork and the OpenNMS project. When asked “What are the top areas where you plan to use open source systems management tools?” 90% answered monitoring, around 60% said configuration and around 50% said patch management. Special skills to use open source systems management tools? Starting in 2009, a much larger percentage of data center managers indicated proprietary systems management software has an advantage over open source tools in advanced product features. 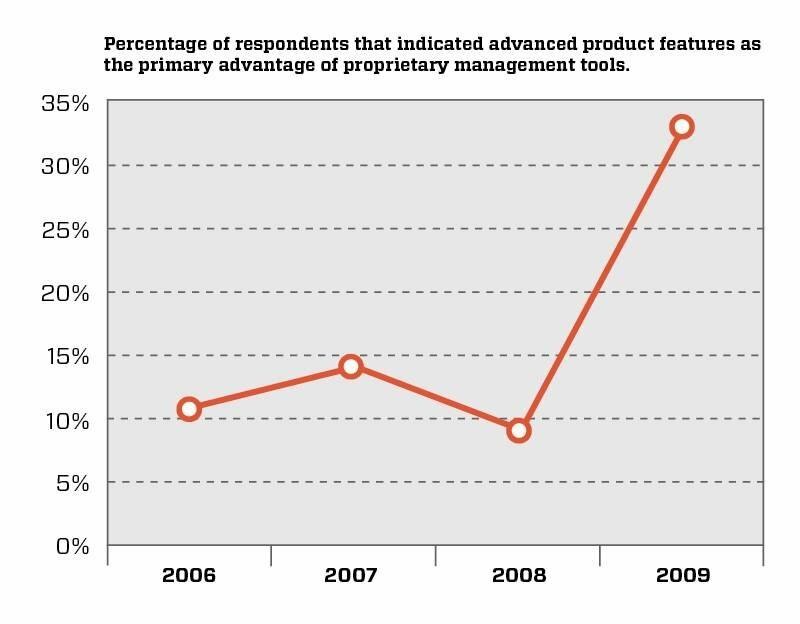 In 2009, 33% of all respondents indicated that product features played a bigger part in defining the advantages of commercial tools, versus 10% in the previous year. Though not explicitly spelled out in the survey, you can translate product features to “virtualization management features.” Matte is using Zenoss’ open source offering, Zenoss Core, and said he has evaluated Zenoss’ proprietary enterprise ZenPacks, which have virtual machine management features. “I have taken a look at the enterprise ZenPacks, and there is nothing like the VMware [Management] Pack in the open source community,” Matte said. Spacewalk is an open source Linux systems management tool and the upstream community project from which the Red Hat Network Satellite product is derived. Spacewalk provides provisioning and monitoring capabilities as well as software content management.James Hogarth, a data center admin in the U.K., uses Spacewalk to manage 100 hosts in a CentOS-based environment for an entertainment website built on the Grails distribution. Hogarth said his company’s entire environment is focused on open source software — even migrating server virtualization from VMware to the Red Hat Kernel-based Virtual Machine (or KVM) hypervisor — and that open source focus was a major factor in the decision to use open source systems management tools. In the open source space, Cfengine and Puppet are leading data center automation and configuration tools. In 1993, Mark Burgess at Oslo University College wrote Cfengine, which can be used to build, deploy, manage and audit all the major operating systems. Cfengine boasts somelarge customers, including companies such as eBay and Google. Cfengine offers a proprietary commercial version called Cfengine Nova. As an open source-only product, Puppet takes a different approach, and its creators, Puppet Labs, make money through training and support.Puppet founder Andrew Schafer, for example, wrote a column on Puppet and how it works. Also, James Turnbull recently wrote a book on using Puppet in the data center. Turnbull has also written tips on Puppet, including the recent article on using the Puppet dashboard. The Oregon State University Open Source Laboratory uses Cfengine for systems management but planned to move to Puppet. “From a technical point of view, Puppet offers more flexibility and an ability to actually use real code to deal with tasks. Cfengine has its own syntax language, but it’s not really suited for complex tasks,” said OSUOSL administrator Lance Albertson in an interview earlier this year. Is Nagios right for your data center? Based on a recent Gartner study, the annual cost of a Wintel rack averages around $70,000 USD per year. This excludes the business cost of a rack. Risking losing business continuity or your infrastructure due to environmental issues is not an option. What are the environmental threats at a rack level?A mistake often made is to only rely on monitoring the conditions at a room level and not at a rack level. The American Society of Heating, Refrigerating and Air-Conditioning Engineers (ASHRAE) recommends no less than 6 temperature sensors per rack in order to safeguard the equipment (top, middle, bottom at front & back of rack). When a heat issue arises, air conditioning units will initially try to compensate the problem. This means that with room level temperature monitoring, the issue will only be detected when the running air conditioning units are no longer capable of compensating the heat problem. It may be too late then.We recommend monitoring temperature per rack at a minimum of 3 points: at the bottom front of the rack to verify the temperature of the cold air arriving to the rack (combined with airflow monitoring); at the top front of the rack to verify if all cold air gets to the top of the rack; and finally one at the top back of the rack which is typically the hottest point of the rack. Intake temperature should be between 18°-27°C / 64°-80°F. Outtake temperature should typically be not more than 20°C / 35°F of the intake temperature. What is the impact of temperature on your systems? High end systems have auto shutdown capabilities to safeguard themselves against failures when temperature is too high. However before this happens systems will experience computation errors at a CPU level resulting in application errors. Then system cooling (fan) will be stressed reducing equipment life time expectance (and as such their availability and your business continuity). near air conditioning units to detect failure of such systems.When multiple air conditioning systems are available in a room, then a failure of one system will initially be compensated by the others before it may lead to a total failure of the cooling system due to overload. As a result temperature / airflow sensors are recommended near each unit to get early failure detection.Humidity in server rooms should be between 40% and 60% rH. Too dry will result in the build up of static electricity on the systems. Too humid and corrosion will start slowly damaging your equipment resulting in permanent equipment failures. When using cold corridors inside the data center, then ambient temperature outside the corridor may be at higher levels. Temperatures of 37°C / 99°F are not uncommon in such setups. This allows to significantly reduce the energy cost. However this also means that temperature monitoring is of utmost importance as a failing air conditioning unit will have a way faster impact on the systems lifetime and availability (fans stress, CPU overheating, …) and running a room at higher temperatures may also affect non rack mounted equipment. Water leakage is a less known threat for server rooms & data centers. The fact that most data centers and server rooms have raised floors makes the risk even bigger as water seeks the lowest point. traditional flooding: same as second point for water leaks from roof or above floors applies 4. Sensors DeploymentAll sensors connect to our Sensorgateway (base unit). A base unit supports up to 2 wired sensors, or up to 8 with the optional sensor hub. * External probes need to be connected to a Sensorgateway (SKU 311323) in order to operate. One Sensorgateway has a built-in temperature probe and can support up to 2 external probes. DC consolidation and migration journey is a rocky one with challenges such as operational disruption, etc. Mandar Kulkarni, Senior Vice President, Netmagic Solutions shares some best practices to follow for a successful DC relocation and migration project.DC migration and consolidation is an uncomfortable truth for most of these Data Center Managers or CIOs. An optimally functioning Data Center is business critical. But chances are that your organizations data center is not adequate in some way. Either it is growing out-of-capacity, compute requirements, operationally exorbitant, outdated or simply doesn’t match up to the growth of the organization. According to a recently published Data Center survey report, over 30% of organizations across the globe plan to migrate or expand their data centers within the next 3 years. Most DCs in India are over 5-7 years old and are not designed for power and cooling needs of today, are running out of space or performance, and their total cost of ownership is almost surpassing the growth in business revenues. Unplanned DC relocation and migration exercise, done without help of experts run into risky waters resulting in cost issues to downtimes and business loss or complete blackout. Here are some best practices to ensure that DC migration project is successful. Start the migration process as you would build a data center. Look at the migration exercise to ensure the new DC will have planned for at least 2 lifecycles of infrastructure. It is important to do a comprehensive review of the current DC. Identify and document your organizations technology and business requirements, priorities and processes. Then do a detailed review of the costs involved in various methods of DC migration and consolidation. It is important to establish business downtime, determine hardware, application and other technology requirements, and prioritize business processes. Identify at least 2 migration methodologies and create plan for both. Bring in all vendors and utility providers into the migration strategies and take them along. It is important to plan the new DC layout before you plan the migration plan. Think about white spaces, creating enough to allow for future growth – it is important to plan the space judiciously, and take help of DC architects to successfully design this part. Putting relocation design into action plan – detailed floor plan, responsibility chart and checklists, migration priorities, map interdependencies, etc. Take into the plan inputs from telecom and power providers, technology vendors, and specialists. Start with a detailed inventory of everything – from applications to business needs to infrastructure including each cable and device to network including every link and port. It all needs to go into a database similar to CMDB. It is critical to know the current DC performance and TCO ratings. Basically, it is important to know your DC well before migration and clear understanding of all aspects of it. Create a baseline for your DC so that it is easy to measure and tweak performance and efficiencies post migration. Organizations should simply assume that things would go wrong and create adequate contingency plan. Detailing and drafting a fully documented risk mitigation and management plan is essential. Then assess, classify, and prioritize them for the purposes of mitigation. It is important to inform all users of the migration plan, from end users to support teams and business owners. The key is to plan to the last T and go through the plan to the minutest detail. Make sure to bring all the critical people to the planning events – facilities staff, project management teams, etc. It is important to select the right time for migration – such as choosing non-month-end and year-end, not coinciding with public events such as elections, festivals, etc. Arrangement of logistics arrangement needs some looking into – who is going to pack and number, name all equipment, who is going to move the equipment to the destination, is there a backup vehicle in case of break down, is there a need for armed guards for the transportation of equipment, etc. Old servers, switches, and storage devices that are out of warranty or considered a risk when subjected to strains and stress of migration should be identified and considered while planning to replace with new. It is an opportunity for you to consider reducing the overall footprint through consolidation in quest to improve reliability, performance, and efficiency of your DC. It is a popular practice to use data center move to consolidate the DC through virtualization. It is important to create a baseline on infrastructure, network and applications before executing the migration plan. It is important to exactly know how things work – creating the baseline. Document and repeat the tests – a full-fledged success plan. DC relocation and migration is not a regular occurrence for any single IT professional to have substantial experience. It is highly recommended to entrust the DC relocation and migration exercise in the hands of an experienced organization who have proven capabilities. If it is only a data center move from one location to the other you should consider a reputable third party to support the move – professional IT mover who will use specialized packing materials, etc. It is recommended to use a professional DC provider with expertise in DC migration and relocation – these establishments will have proven data center relocation methodology and best practices that they can leverage for better results and success. Finally, even superior planning cannot offset unexpected failures. Contingency planning is critical even after the migration plan has taken into consideration all the common pitfalls. Planning for a failure is better than running pillar to post when it occurs. If during transportation equipment is damaged or does not function at the destination, it amounts to delays or disruptions in setting up the new DC. It is important for the DC migration expert helping you to have standby equipment in cases such as these. It is important for insuring all equipment in case of any major disasters occur during the whole migration process. If you are using a professional DataCenter provider, it is important to add insurance to the checklist of requirements. It is critical to identify all external dependencies such as network service providers, etc. and their availability at the destination. In today’s dynamically changing marketplace and unpredictable economic climate, it is critical that data centers facilitate current business operations as well as provide for the future growth of the business. Following the best practices will ensure success of the DC relocation and migration – a good way to prevent disaster. With shifts in the scale and density of data centers, one industry organization is drawing up ways to standardize how we talk about data center size and power needs. There are plenty of metrics to measure data center footprint and power and cooling needs. AFCOM, the data center managers’ association, thinks it’s time to pare that down. “You’ll hear people say ‘I have a very dense data center’ or ‘We have a small data center’ and that doesn’t really mean anything or relate to specific numbers,” said Tom Roberts, AFCOM president. The association’s Data Center Institute think tank worked with data center designers, operators and vendors to qualify the terms for data center size and density, presented in the free paper, Data Center Standards. Read an excerpt from the paper here. AFCOM describes data center size by compute space, and density by measured peak kilowatt (kW) load. AFCOM segments data center density into four categories: low (up to 4 kW per rack), medium (5 kW to 8 kW), high (8 kW to 15 kW) and extreme (more than 16 kW per rack average). The focus on density is timely. Colocation contracts revolve more around power today than they did five years ago, when the conversation was about space, said John Sheputis, president, Infomart Data Centers, a U.S. colocation space provider. Server consolidation — via virtualization and processor evolution — increases data center density per square foot. There are fewer cabinets and fewer power supplies to manage, with less fiber to run — all good things from an IT operations point of view, Sheputis said. But these trends change the understanding of high and low density. Cosentry, a colocation provider headquartered in Omaha, Neb., tracks average power draw per cabinet in its facilities to baseline server space designs. Infomart experienced this firsthand when merging its Dallas operations with Fortune Data Centers’ Hillsboro, Ore., and San Jose operations, and acquired a former AOL data center in Ashburn, Va.
“The energy density of older data centers is two to three times lower than in newer data centers,” Sheputis said, adding that standards for energy density change greatly in a short time. This was evident comparing the older Ashburn facility to the state-of-the-art facility in Dallas. Ashburn will undergo a renovation, not just for space but for higher-density operations, before opening in 2015. AFCOM plans to aggregate similar baseline tracking and comparison data for a broad swath of data centers by standardizing size and density terminology. Although AFCOM’s categories classify the total density of the data center, the devil for planning that space is in the details. The same square footage that previously held 2 kW mixed cabinets now has a row of 8 kW servers, a set of storage arrays consuming 4 kW each, and low-power network and peripheral cabinets. A supercomputing island in one part of the data center handles big data processing at 15 kW per rack, while the other racks use only 3 kW or 4 kW each. Facility planning isn’t just about aggregate power and cooling needs, but also the layout of IT systems using the space. Square footage discussions are still useful, Black said. But the most important thing is how many rack location units are available in a given space. AFCOM therefore segments data center sizes, from mini (room for up to 10 racks) through mega (room for more than 9,000 racks), in combination with the density measurements above that yield power demand information. “Watts per square foot is a flawed standard for today’s workloads,” Cosentry’s Black said. Rack location units is a term that’s evolved recently to help estimate utilization in a given room footprint, or estimate capacity. It takes into account the cabinet footprint and hot and cold aisle allowances. But not every IT organization can discuss their data center needs by this metric. In an on-premises data center, perhaps clarity around power and density doesn’t matter as much. The power bill comes out of the facilities budget, and as long as cooling keeps up with the hottest cabinet in the room, your terminology is unimportant. But today, on-premises facilities face end of life or major upgrades, power usage effectiveness comes under executive-level (and executive branch) scrutiny, and many companies plan the move into a colocation facility. Suddenly, IT leaders need to know how to communicate effectively about the space, power and cooling that important workloads require. AFCOM’s intent is for a data center manager to be able to measure compute space, designed density and current power draw, and say that they run, for example, a small-size data center designed for low density, currently operating at medium density at 52% of rack yield. Managing and operating a data center comprises a wide variety of activities, including the maintenance of all the equipment and systems in the data center, housekeeping, training, and capacity management for space power and cooling. These functions have one requirement in common: the need for trained personnel. As a result, an ineffective staffing model can impair overall availability. The Tier Standard: Operational Sustainability outlines behaviors and risks that reduce the ability of a data center to meet its business objectives over the long term. According to the Standard, the three elements of Operational Sustainability are Management and Operations, Building Characteristics, and Site Location (see Figure 1). Management and Operations includes the behaviors that are most easily changed and have the greatest effect on the day-to-day operations of data centers. All the Management and Operations behaviors are important to the successful and reliable operation of a data center, but staffing provides the foundation for all the others. Data center staffing encompasses the three main groups that support the data center, Facility, IT, and Security Operations. Facility operations staff addresses management, building operations, and engineering and administrative support. Shift presence, maintenance, and vendor support are the areas that support the daily activities that can affect data center availability. In order to be fully effective, an enterprise must have the proper number of qualified personnel, organized correctly. Uptime Institute Tier Certification of Operation Sustainability and Management & Operations Stamp of Approval assessments repeatedly show that many data centers are less than fully effective because their staffing plan does not address all three categories. The first step in developing a staffing plan is to determine the overall headcount. Figure 2 can assist in determining the number of personnel required. The number of hours for all these activities must be determined for the year and attributed to each trade. For instance, the data center must determine what level of shift presence is required to support its business objective. As uptime objectives increase so do staffing presence requirements. Besides deciding whether personnel is needed on site 24 x 7 or some lesser level, the data center operator must also decide what level of technical expertise or trade is needed. This may result in two or three people on site for each shift. These decisions make it possible to determine the number of people and hours required to support shift presence for the year. Activities performed on shift include conducting rounds, monitoring the building management system (BMS), operating equipment, and responding to alarms. These jobs do not typically require all the hours allotted to a shift, so other maintenance activities can be assigned during that shift, which will reduce the overall total number of staffing hours required. Once the total number hours required by trade for maintenance and shift presence has been determined, divide it by the number of productive hours (hours/person/year available to perform work) to get the required number of personnel for each trade. The resulting numbers will be fractional numbers that can be addressed by overtime (less than 10% overtime advised), contracting, or rounding up. A properly organized data center staff understands the reporting chain of each organization, along with their individual roles and responsibilities. To aid that understanding, an organization chart showing the reporting chain and interfaces between Facilities, IT, and Security should be readily available and identify backups for key positions in case a primary contact is unavailable. The first data center had two to three personnel per shift covering the data center 24 x 7, which is one of the larger staff counts that Uptime Institute typically sees. Further investigation revealed that only two individuals on the entire data center staff were qualified to operate and maintain equipment. All other staff had primary functions in other non-critical support areas. As a result, personnel unfamiliar with the critical data center systems were performing activities for shift presence. Although maintenance functions were being done, if anything was discovered during rounds additional personnel had to be called in increasing the response time before the incident could be addressed. The second data center had very qualified personnel; however, the overall head count was low. This resulted in overtime rates far exceeding the advised 10% limit. The personnel were showing signs of fatigue that could result in increased errors during maintenance activities and rounds. The third data center relied solely on a call in method to respond to any incidents or abnormalities. Qualified technicians performed maintenance two or three days a week. No personnel were assigned to perform shift rounds. On-site Security staff monitored alarms, which required security staff to call in maintenance technicians to respond to alarms. The data center was relying on the redundancy of systems and components to cover the time it took for technicians to respond and return the data center to normal operations after an incident. Although these examples show deficiencies in individual data centers, many data centers are less than optimally staffed. In order to be fully effective in a management and operations behavior, the organization must be Proactive, Practiced, and Informed. Data centers may have the right number of personnel (Proactive), but they may not be qualified to perform the required maintenance or shift presence functions (Practiced), or they may not have well-defined roles and responsibilities to identify which group is responsible for certain activities (Informed). Figure 3 shows the percentage of data centers that were found to have ineffective behaviors in the areas of staffing, qualifications, and organization. Staffing (appropriate number of personnel) is found to be inadequate in only 7% of data centers assessed. However, personnel qualifications are found to be inadequate in twice as many data centers, and the way the data center is organized is found to be ineffective even more often. Although these percentages are not very high, staffing affects all data center management. Staffing shortcomings are found to affect maintenance, planning, coordination, and load management activities. The effects of staffing inadequacies show up most often in data center operations. According to the Uptime Institute Abnormal Incident Reports (AIRs) database, the root cause of 39% of data center incidents falls into the operational area (see Figure 4). The causes can be attributed to human error stemming from fatigue, lack of knowledge on a system, and not following proper procedure, etc. The right, qualified staff could potentially prevent many of these types of incidents. Adopting the proven Start with the End in Mind methodology provides the opportunity to justify the operations staff early in the planning cycle by clearly defining service levels and the required staff to support the business. Having those discussions with the business and correlating it to the cost of downtime should help management understand the returns on this investment. When developing an operations team to support a data center, the first and most crucial decision to make is to determine how often personnel need to be available on site. Shift presence duties can include a number of things, including facility rounds and inspections, alarm response, vendor and guest escorts, and procedure development. This decision must be made by weighing a variety of factors, including criticality of the facility to the business, complexity of the systems supporting the data center, and, of course, cost. For business objectives that are critical enough to require Tier III or IV facilities, Uptime Institute recommends a minimum of one to two qualified operators on site 24 hours per day, 7 days per week, 365 days per year (24 x 7). Some facilities feel that having operators on site only during normal business hours is adequate, but they are running at a higher risk the rest of the time. Even with outstanding on-call and escalation procedures, emergencies may intensify quickly in the time it takes an operator to get to the site. Increased automation within critical facilities causes some to believe it appropriate to operate as a “Lights Out” facility. However, there is an increased risk to the facility any time there is not a qualified operator on site to react to an emergency. While a highly automated building may be able to make a correction autonomously from a single fault, those single faults often cascade and require a human operator to step in and make a correction. The value of having qualified personnel on site is reflected in Figure 5, which shows the percentage of data center saves (incident avoidance) based on the AIRs database. Equipment redundancy is the largest single category of saves at 38%. However, saves from staff performing proper maintenance and having technicians on site that detected problems before becoming incidents totaled 42%. The cost of having qualified staff operating and maintaining a data center is typically one of the largest, if not the largest, expense in a data center operating budget. Because of this, it is often a target for budget reduction. Communicating the risk to continuous operations may be the best way to fight off staffing cuts when budget cuts are proposed. Documenting the specific maintenance activities that will no longer be performed or the availability of personnel to monitor and respond to events can support the importance of maintaining staffing levels. Cutting budget in this way will ultimately prove counterproductive, result in ineffective staffing, and waste initial efforts to design and plan for the operation of a highly available and reliable data center. Properly staffing, and maintaining the appropriate staffing, can reduce the number and severity of incidents. In addition, appropriate staffing helps the facility operate as designed, ensuring planned reliability and energy use levels.